After years of anticipation from their foundation in 2010, Respawn Entertainment has released its first title: Titanfall. With such prominent figureheads like Jason West and Frank Zampella of Infinity Ward fame behind the project, it's easy to see why shooter enthusiasts were brimming with excitement to know what their first big title would hold. 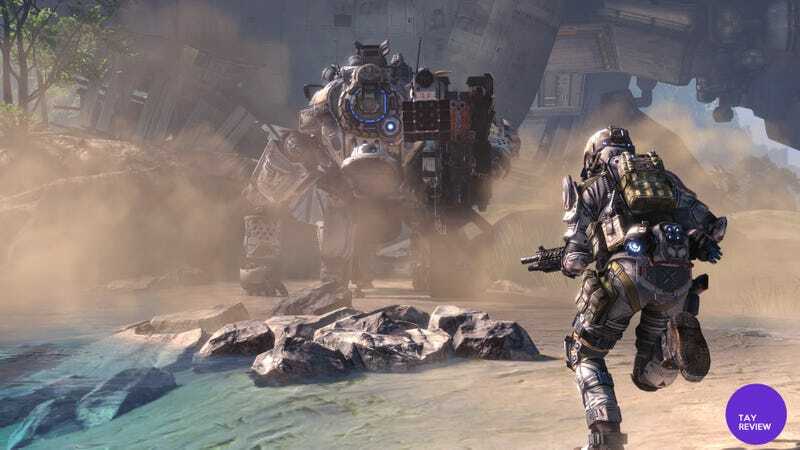 Despite the rather impressive resume behind Respawn Entertainment's staff, however, it's hard not to be skeptical of a new drop into the ocean of shooters anymore—so does Titanfall live up to its legacy? Or is it just another shooter that was doomed to fall? Let me start out by saying that the movement in Titanfall is one of the game's most prominent features. Players will be wall climbing, double jumping, and vaulting over various obstacles to get around the map—and the map certainly allows for it. Each map is designed almost perfectly to inject quite a bit of excitement and fun into what would otherwise be a tedious jog to find the enemy team. Other than the layout themselves, the maps are gorgeous to look at, taking on a variety of themes from futuristic cities to industrialized, rural oil centers. Luckily, they also break away from the mundane brown and gray that are so commonplace in the current generation of shooters, taking advantage of their futuristic setting to inject beautiful skyboxes, wall art, and bits of colorful, neon technology to keep players interested in their surroundings. The gunplay is all but perfect for what the game set out to do. Each weapon has a fantastic feel and design. When shooting, the guns have just enough kick to give the player a sense of weight while not being overly obnoxious or making aiming and firing distracting, which is great in a game that has such an emphasis on mobility. While there aren't a grand number of weapons to choose from, each weapon seems unique in its purpose and function. This is especially true with weapons like the Smart Pistol, a gun which requires the player to hover over an enemy while it locks on, but can lock on to multiple enemies, or the MAG launcher, an anti-Titan weapon that shoots heat-seeking grenades, making indirect combat much more practical. In essence, each weapon feels good and feels distinct from the other weapons, and they are all incredibly satisfying to use. The player's main mechanical force comes in the form of Titans, and controlling one is just as wonderful as it sounds. Players are given speed boosts, a large amount of ordnance and other special abilities to choose from to make their Titan a more effective killing machine—and it can do almost anything you would expect it to. It can run over players and NPC's, it can punch through enemy Titan's cockpits and rip their pilots out, or it can launch giant beams of lightning that surge through enemy lines. It is all but a guarantee that any moment spent with a Titan will be the highlight of that match. Titan's are, from what I can gather, the answer to removing Kill Streaks. Rather than keeping such an integral part of the game for only those who never die, Titans are, instead, an inevitability. The reward for good play comes instead in the form of a reduced counter on either the players' next Titanfall, which is when their Titan spawns in, or if they do well while already piloting their Titan, then instead it reduces the cooldown on the Titan's special ability. This careful balance gives everyone the satisfaction of calling in a Titan—everyone has this one point in the match to look forward to. And if someone is doing exceptionally well, that person can call in a Titan multiple times, or even use the Titan's ability a few times before it's destroyed. While some could call this "casualizing" the gameplay, I see it more as incentivizing everyone to play one more round. Achieving a Titanfall is truly one of the more satisfying moments in any match, and taking one out, either on foot or in another Titan, is just as exhilarating. The game is littered with enemy non-playable characters dropping in from the sky at various points of the map. Killing them nets players EXP and match points or a reduced cooldown for their Titanfall. Other than that, that's about all there is to know on these fellows. They rarely do enough damage to create any sort of threat, and they are, at best, an annoyance. Rather than make the combat feel larger, it becomes apparent that they are only there to fill in space and keep the combat moving. While this could have been solved with better AI, harder hitting weapons, or simply more enemy diversity, it was left in a rather lackluster state. The addition of NPC's to matches was an incredibly interesting idea, but was sadly not implemented well. The customization of player loadouts is noticably sparse. There are only ten primary weapons to choose from for your pilot, as well as three sidearms and four anti-Titan weapons. For the Titans, there are only three chassis and six Titan-based weapons. While this is ample enough to make a unique loadout, the customization just feels flat compared to some of the other custom-heavy shooters that have come out lately. It seems like rather than making a wide variety of weapons, Respawn Entertainment worked on polishing the few they had. This didn't bother me as much, but I know for people who adore customization, this is worth keeping in mind. The PC has its fair share of technical limitations. For starters, the game is a whopping forty-nine gigabytes, which is noticeably larger than the Xbox One's seventeen gigabyte download. The cause of this, reportedly, is the thirty-five gigabytes of decompressed audio files. It would have been fantastic to see some option to recompress the audio files, at the very least, or remove the unnecessary ones altogether. In addition, the maximum field of view is ninety, which, while it is roughly par for shooters anymore, I would have expected a much higher ceiling for such an important PC release. As of right now, matchmaking is painfully bad. Rather than running into issues with networking problems as everyone was expecting it to, however, this is a much more blatant problem than anyone would have thought: there is no auto-balancing for teams in the lobby or in the game. In fact, during the time I spent with the game, there were times when one team would outnumber the opposing team for multiple games before the matchmaking system put a player on the appropriate team. I even went through most of the campaign on a team that was down by three people. It's ridiculous, it's frustrating, and it should have been fixed before the game shipped. Titanfall opted to not have a single-player campaign, choosing instead to tell the story through the multiplayer. Players will choose to play as either the IMC or the Militia during the campaign and then go through a set narrative. While this sounds good, the two campaigns are actually one campaign, just played on opposite teams, and there almost no differences between the regular multiplayer and the campaign. There are only two types of game modes that are played throughout the campaign: a King of the Hill variant, named Hardpoint, and a Team Deathmatch variant, named Attrition. If the player's team wins, they receive positive dialogue at the end of the match. If the team loses, they get negative dialogue at the end. Other than that, that's... about it. The story is given out through brief talks before the mission starts, or sometimes during the missions themselves, which is difficult to pay attention to during an intense firefight. I remember specifically during one of the missions, after my loss, as I was boarding an evacuation ship, the humiliating defeat that I had just suffered was immediately retconned. "Command still views this as a military victory," I heard through my speakers. I couldn't help but try to remember how many points we lost by and how absurd that seemed to me. Maybe we dried up the enemy's munitions reserves by dying so much, I'm not entirely sure since it wasn't really explained. And that's exactly the problem with Titanfall's campaign. There was no care put into it. It's hard to pick up any of the narrative or attempt to piece things together when it's simply given through audio files between what is basically a series of multiplayer games. Players don't participate in the narrative. There are no special objectives, only kill things or hold a point, depending on the game mode that the mission is based on. It's nothing special. It should say a lot that I'm still recommending this game after my "Terrible" section. Despite the frustrations I've had with it, it's incredibly hard for me to stop playing it. The combat, gunplay, and satisfaction of doing these incredible stunts and kills is just something that can't be obtained anywhere else in the market right now. Titanfall may have messed some things up, but it did a lot more right than it did wrong. I recommend giving it a shot wholeheartedly.